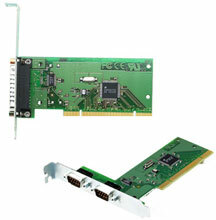 The Digi Neo is a multi-port serial card with Universal PCI (3.3V and 5.5V) bus slot support. It offers up to eight RS-232 serial ports with throughput speeds exceeding 460.8 Kbps. Surge suppression on all signals ensures voltage fluctuations will not degrade data transmissions. Flexible cabling/connector options include RJ45, DB-9 and DB-25 connectors. Includes an Application Specific Integrated Circuit (ASIC) for reliable performance. Neo supports most popular operating systems, has enhanced software monitoring and diagnostic tools, and has a robust feature set.